As I write this I’m visiting the spectacular Cook Islands. We’ve just had a visit from the complex’s handyman as our air-conditioning was making a bit of a strange noise. He arrived, fixed the problem and went on his way. I thought it was strange as he disappeared as he didn’t even say he was done and was leaving. But then he returned, and where his ladder had been, he started to sweep. 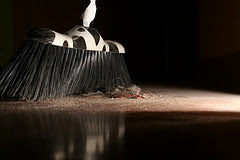 There had been some minute dust and debris knocked as he was doing his work and he swept the floor beautifully clean. With a smile and a wave he was then done. Simple, thoughtful service that made a lasting impression. His sweeping, was a clean sweep in the service stakes on this trip so far. In my industry: real estate, this might be as simple as offering to take your shoes off at any front door you come to. A hairdresser might offer every client a drink while they’re having their hair done. A waitress might take time to get to know a child by name. What can you do today that charms, surprises and delights?